Tone 11 holds the Intention of Resolution, a clarity of vision that facilitates dynamic developments. What we learn through Tone 11 offers the Vision to clearly see and resolve a new way forward. The Master Number 11 is a symbol of Enlightenment. 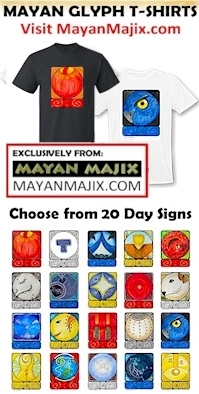 Deer/MANIK is the Day Sign of Spiritual Tools and represents the Mayan priest. The Deer represents Human’s Mission and Purpose to guide and serve the Whole. Deer’s most used Spiritual Tool is vigilance. Said to “uphold the pillars of the 4 directions” MANIK Knows the way to maintain the integrity of our new world of Spirit. MANIK is also known as Hand. The glyph illustrates a hand with forefinger and thumb grasping a Spark of Ether that completes a circuit to the Divine Power of the Creator. Deer maintains the Integrity of its Truth through a vigilant Communion with the Creator. 11 MANIK helps us to see our Life on Earth from the Perspective Up Above. Tone 11 is the day the shaman climbs to the Highest Altar for a Divine Discernment. Deer grasps the Power of Divine Spirit through the Service of Ritual and Sacred Ceremony. The Mayan priest is not a “preacher” but is designated as the One who observes the Sacred calendar and performs the Rituals and Ceremonies that maintain Right Relationship among the people, and maintains a Divine Relationship for the Whole. MANIK maintains the integrity of its Divine Authority through the surrender of its own Ego, Acknowledging the Divinity of the Whole and the Equality of the Truth we can Discern for our Self. Deer is the leader that doesn’t need to have all the Answers for everyone. Others can discern their own Truth by what they see through a demonstration. Tone 8 holds the Intention of the Justice of Harmony and Equity. The Maya count 12 hours of daylight, associated with the Tone numbers. Tone 8 is the Holy Day of the trecena, representing the Sun in its zenith, the Brightest Light of Illumination. On Tone 7 the effort of our Spiritual Climb was measured for the Balancing of Above and the Below. Our measure lies in the Highest Intention we held in our heart. Tone 8 is defined by the Maya as the number of “pure spirit.” A Divine Agency Knows our Heart and will Intervene with Divine Justice. The Divine Justice for Faith is Believing. Seed/KAN is exalted in Tone 8. Today begins the Transformation phase of the trecena. Seed/KAN guides a Transformation of personal Identity. A new Seed of our Self is Fired by the Creator with a Spark of Divine Consciousness. In our harvest cycle of the Tzolk’in round, our buds are beginning to appear where flowers will bloom. The buds appearing relate to our first Consciousness that we will bear the Fruit of Spirit, holding the Seed of our Creation. Tone 7 holds the Intention to Balance the Above and the Below. What we create in one realm of Being, is balanced in all the realms of the Mind, Matter, and Spirit. Our movements made in any realm have a direct influence on the state of another. Night/AKBAL is the Dreamer and the Light that Shines in the Darkness. Mystical experiences are associated with AKBAL as it makes a connection between our Intelligence and Intuition. AKBAL connects us to higher dimensions and speaks to us through our dreams. AKBAL resides in the West, the Direction of our Unknown Experience, the “hard road of life,” and the void that holds unlimited potential. Until we see and define our future, anything could happen. AKBAL is rich with Potential. What we define as Real in our Dreams, will be made Real in all our realms of existence. This is the mystery of Creation that Human struggles to see, as an Unseen Force of our Spiritual Nature. Once we master this Truth, we hold the “Keys to the Kingdom.” This is the Light of AKBAL, the Dreamer who Believes in the Dream. Tone 7 is a tone of reflection to see all that is, and all that is not. At the top of the pyramid of our climb of Spiritual Growth, we are given the ability to see far in all directions. This the place to reflect on our experience. What we define as our Truth will be made True in our Mind, Body and Spirit. Like a Gift from the Above to the Below, AKBAL helps us discern the Truth of Spiritual influence on our experience of Mother Earth. This a day when we can hear the Voice of Spirit and know it is Real.